United Yacht Sales New Jersey would love to guide you through a personal showing of this 48' Krogen 48 Whaleback 1999. 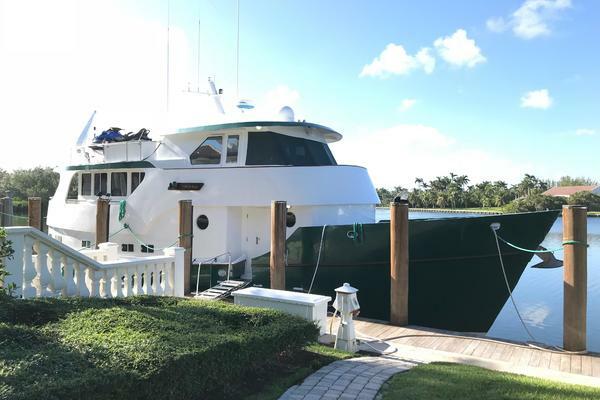 This yacht for sale is located in Charleston, South Carolina and priced at $569,000. For a showing please contact us by filling out the form on this page and we will get back to you shortly! The main saloon is huge, open and airy. Port, starboard and aft opening windowshave teak valances and new Hunter Douglas custom window treatments. Thedouble teak doors have have a Clear View retractable screen system. To starboard, there is an L-shaped settee with storage beneath & behind and a hi-lo folding leaf dining table. The settee & table also converts to a very comfortable double berth.To port there is an L-shaped settee with storage beneath and two built-in side tables.There is a large flat screen Smart TV mountedon the forward bulkhead, and mounted lamps port and starboard. The settees have recently been reupholstered with Ultra Leather, and there is new carpeting throughout the living areas. The master stateroom is forward and features an islandqueen berth and enormous headroom - no claustrophobia here! . There are large drawers at the foot of the berth and full storage beneath. Storage is completed with two large hanging lockers, two dressers with drawers, and a large lighted vanity. There are opening port lights and overhead hatches with retractable shades. There is a bulkhead mounted HDTV to starboard. All soft goods, including the mattress have been replaced. The en-suite head features a large separate shower stall with teak grate, opening port and bi-fold door,new Vacuflush all-ceramic full sizefresh water toilet,a linen closet, medicine cabinet new ceramic tile floors and Corian counter top. The port-side stateroom is currently configured with a fixed double berth, but it could be converted back to an L-shaped settee that pulls out to a berth. For additional sleeping, there isa Pullman berth that folds down from above.There is a large hanging locker, bookshelves and a desk with chair and file drawer storage as well. A very large opening window and an opening port provides lots of natural light and ventilation. This cabin has its own air conditioning/heat controls. All soft goods, including the mattress, have been replaced. The guest head is to starboard and has a newVacuFlush all-ceramic full sizetoilet, new tiled floor, separate stall shower with teak grate and opening port,and Corian countertop with a medicine cabinet above the sink as well as a large separate storage locker. Just outside the guest head is the stack washer and separate dryer. To starboard, forward of the guest head, is the Custom Pantry/Office/Workroom storage compartment that contains the large custom top-loading freezer and top-loading dry goods storage, a desk with shelves and loads of drawer and locker storage space. The flat surface of the freezer compartment serves as a work bench, clothes folding table, etc. Just close the door and all your project mess is out of sight! The ship-sized pilothouse is surrounded by windows for a 360 degree view for captain, crew and guests. The side and aft windows open for additional ventilation. Dutch Opening doors with Clear View retracting screens on port & starboard sides provide quick & easy deck access. There isa large L-shaped settee, which has recently been reupholstered with Ultra Leather, that converts to a double berth and a high/low dining table. Generous storage under the settee, abundantcabinet storage and a wet bar with Ice Maker complete the layout. A Stidd leather & chrome helm chair provides the Captain comfort for those long passages. With abundant seating and spectacular views, the pilothouse is the perfect place to gather while underway or at anchor. The main engine and generator are in the aft engine room with the fuel tanks and water heater while there is a forward machinery room that is separate from the heat and noise of the engine and generator. This forward machinery roomincludesthe water tanks, house batteries, dual Racor fuel filters, fuel polishing, stabilizers, water maker and work bench.